"Jeff — the most serious clown, the deepest philosophical trickster it has been my pleasure to know — is a splendid singer, pianist, bandleader, archivist of lost songs, sixty-second cousin of Thomas Waller you could imagine. In fact, you can’t imagine Jeff. He surpasses anything you could think up." "Your program was such a delight and a revelation as well. I don't know when I've enjoyed myself so much at a concert. Yes it was a concert, but it was also an Event, a Happening. I will be so glad to sing your praises to all!" "When it comes to talent, speed, versatility, creativity, mastery of multiple genres and just plain entertaining zaniness, Jeff Barnhart stands alone." John Hallam, reeds; Bruce Rollo, bass; Nick Ward, drums. Honeysuckle Rose; At Twilight; Hold My Hand; Keepin' Out Of Mischief Now; Keep A Song In Your Soul; Moppin' And Boppin'; You Must Be Losing Your Mind; Blue Turning Gray Over You; Ain't Misbehavin'; Rump Steak Serenade; My Fate Is In Your Hands; Your Feet's Too Big; Twelfth Street Rag; Do You Have To Go? ; The Joint Is Jumpin'. This CD was produced to introduce Jeff Barnhart's new concert show on the life, times and music of Fats Waller (and no doubt with an eye to after-concert sales), but please don't wait until the show appears at a venue near you before you acquire a copy of this excellent disc. Jeff scarcely needs introducing to Just Jazz readers, but for the record he is a fantastic pianist, a fine goodtime vocalist, a positive cornucopia of tunes both familiar and obscure, and a wonderfully larger-than-life personality: all in all, not too far away from a description of Mr. Waller himself, come to think of it, but though I can personally vouch for Mr. Barnhart's healthy appetite, all comparisons with Fats end well before the waistline! On the present CD, Jeff serves us up a hearty helping from Fats' astonishing musical menu (said to be in excess of 500 compositions, including those he sold to other composers and which did not appear under his name). As for any popular concert program, Jeff has wisely selected a mix of the familiar favorites and some of Waller's lesser-known - but never less musically rewarding - offerings, quite a few of which come from the latter years of Fats ‘career leading up to his untimely death in 1942 at the age of just thirty-nine. Amongst the relative rarities, it's perhaps worth drawing attention to Do You Have To Go? and At Twilight, two tender ballads written by Fats with lyrics by his second wife, Anita, rather than his longtime lyricist Andy Razaf, also the1943 Moppin' And Boppin, co-written with Benny Carter and You Must Be Losing Your Mind, an up-tempo morsel from 1942, while among the better known tunes a thoughtful treatment of the lovely My Fate Is In Your Hands is perhaps the standout number on the CD (to my ears at any rate) with a fine performance from Jeff and a tender reading from John Hallam on tenor. While Jeff is the central figure around whom all revolves, he is blessed without standing accompaniment from the other members of his little band: to single anyone out is, I know, invidious, but I must mention Jamie Brownfield on trumpet. In amongst the (relative) veterans here, he plays with a tone, swing, poise and assurance that belie his (relatively) tender years: if this is how he sounds while still a teenager, then watch out for the things to come! To close, I should also mention Ray Smith's informative and insightful booklet notes, which give a lot of background to Fats' career in general and to the writing of the songs on this disc in particular. Add Lake's usual excellent sound quality and ample playing time and you have no excuse for not acquiring this recording "toot sweet - it's a killer-diller!" to paraphrase Mr. Waller. 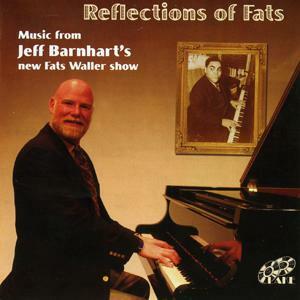 review of "Reflection of Fats"
Jeff Barnhart is not only a top stride pianist but a personable singer and a witty personality. Waller'ing Around features him paying tribute to another notable pianist-singer-personality by performing 15 Fats Waller compositions. Barnhart, who takes vocals on some of the numbers including an inventive (and rightfully riotous) version of "The Joint Is Jumpin,'" not only plays some of Waller's hits and famed piano features but such obscurities as "Ev'ry Sweetie That I Get" (which receives its first-ever recording here), "Lonesome Me," "Midnight Stomp" and "Hold My Hand." Barnhart's singing purposely hints strongly at Waller but his piano playing (despite the inclusion of some Wallerisms) is pretty much his own. His heartfelt rendition of "Black And Blue" and extended version of "Clothes Line Ballet" are among the highpoints. 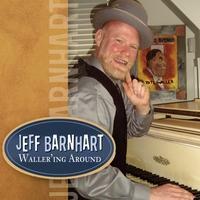 Waller'ing Around is highly recommended and available from www.jeffbarnhart.com.